Optical Switch Solutions built on the industry-leading, fourth-generation instrumentation class of VIAVI optical switch technology. Manufacturing test automation is critical to reducing product costs and optical switches are at the heart of any automated test system. 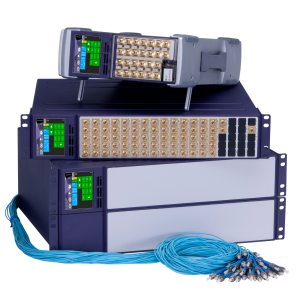 The VIAVI mOSW-C1 Optical Switch Module and mISW Optical Switch Tray are built on the industry-leading, fourth-generation instrumentation class of VIAVI optical switch technology. With more than 30 years of leadership in optical switching across network, monitoring, and manufacturing applications, the mOSW-C1/mISW-C1 represents a new milestone for performance and reliability with the industry’s smallest footprint.